>>>> A tasting room favorite! This wine has been a tasting room favorite since we started making it in 2012. Primitivo is easier to grow in Washington than Zinfandel and offers very similar and crowd-appealing flavors and characteristics. Bold and delicious; filled with plum and cherry flavors. Aged in 40% new oak barrels ( 20% American, 20% Russian) this wine is incredibly food friendly and supple. It has an exotic spice finish that goes on forever. Primitivo is the Italian equivalent to California Zinfandel but with an Old World flair. The grapes for this wine come from the l-acre Doebler Vineyard in the foothills of Saddle Mountain in Mattawa, Washington, The topsoil is wind-blown sand that provides great drainage and uniformity in plant vigor and ripening. This vineyard is surrounded by basalt cliffs which trap the heat and allows the grapes to ripen fully and early in the season. Cool nights on the Wahluke Slope allows for retention of acidity producing balanced wines. The Petite Sirah comes from the venerable Kiona Vineyard on Red Mountain. 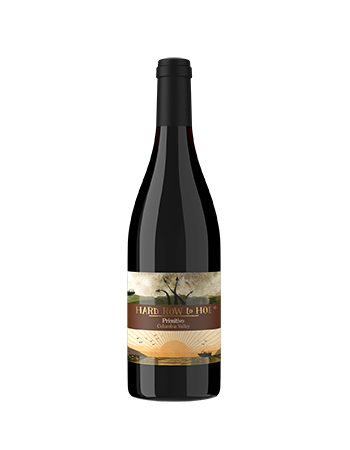 The grapes for this wine come from the l-acre Doebler Vineyard in the foothills of Saddle Mountain in Mattawa, Washington, The topsoil is wind-blown sand that provides great drainage and uniformity in plant vigor and ripening. This vineyard is surrounded by basalt cliffs which trap the heat and allows the grapes to ripen fully and early in the season. Cool nights on the Wahluke Slope allows for retention of acidity producing balanced wines. The Petite Sirah comes from the venerable Kiona Vineyard on Red Mountain. The grapes for this wine were handpicked after an almost perfect growing season, transported to the winery then hand sorted at the crusher. The grapes were gently destemmed leaving 100% whole berries. Fermentation occurred in a stainless steel, open-top fermenter, employing 2 pump overs per day. After fermentation, the wine was gently pressed off the skins, settled overnight and transferred to oak barrels: 20% new American (Virginia) oak, 20% new Russian oak and 60% neutral oak. The wine was in barrels for 12 months before being blended with 14% Petite Sirah and cross-flow filtered. We chose a Stelvin closure to best preserve the wine's lively characteristics. If you love Primitivo, try the Double Dip! Try this other elegant red wine!